Hoorah, we can all confess. 🙂 I admit that I have an citrus peeler like this for oranges: http://tinyurl.com/5tfws5 It’s just FABULOUS. As someone who keeps fingernails chopped down I seriously love it. And it’s so tiny it’s hardly clutter anyway. My favorite unitasker is the dual bladed grapefruit knife. Yes, because of the dual blade, it sections graprefruits twice as fast, and always in a straight line. I’m a sucker. I don’t care. I have that wine opener, and I can think of ten things I’d get rid of before I’d get rid of that. No question it makes opening a bottle of wine effortless. It’s simply a great design. My popcorn maker, definitely. Microwave popcorn doesn’t hold a candle to air-popped, in my book. I use it all the time. I have a jar opener than breaks the seal on jars so they’re easy to open. It’s great for those stubborn jars I can’t open when there’s no man in the house. Not everyone will agree with me, but I love our rice maker. We have steamed rice once or twice a week, and it’s *so easy* with the rice maker — I can’t seem to make rice stove-top without burning it. Now I can just press a button and wait for the ding. I was going to say the lever-style wine opener, too, but since that’s already taken, I’ll go with my garlic press. I love mincing garlic with a knife as much as anyone (no, really! ), but occasionally I’m making something that either requires a LOT of minced garlic, or I want the specific texture of *pressed* garlic, rather than *minced*. Maybe it’s only in my brain that there’s a difference, but there you go. I love my mushroom slicer. Yes, I could just slice them with a knife, but we eat mushrooms once or twice a week, and it saves so much time! I love that wine opener! I first saw it at a friend’s house and I went out the next day to buy my own – for $10 you can’t beat it! Like SueDoc above, I also love my rice cooker. To be fair, I make more than just rice in mine. It is also great for steel cut oatmeal and steaming veggies. One of my other favorite unitaskers is my egg slicer. I love egg salad and the slicer makes the prep much faster. I also have a rice maker and I LOVE IT. We have rice several times a week. It is cute and red and doesn’t take up a burner on the stove. Plus it is self-timed and easy to clean. It was a Christmas gift this year from one of my aunts. It does serve one purpose- to make me happy! We have a Zojrushi bread maker that we got for a wedding present and love. It’s quick and easy to use, makes a pretty normal sized loaf and homemade bread tastes so much better than any store-bought bread. We use it once or twice a week. You can have my French-made steel crêpe pan when you pry it out of my cold, dead, butter-soaked hands! We received one of those wine openers for our wedding too. I used it once and returned it. It takes up a ridiculous amount of space for something that I can do faster with a waiter’s-style wine opener that sits right in my flatware drawer. With a tiny bit of practice you can learn to have your wine open before you’d be able to take that giant contraption out of the box. I can’t abide by that tomato knife either. A regular serrated knife for slicing breads, cakes, etc. works just fine on tomatoes. I’m with you on the ice cream maker. And you should never have to apologize for safety equipment like a fire extinguisher. @Sarah — I completely forgot about my garlic press! Definitely add it to my list of unitaskers!! Also, I own a rice cooker, but I do so many other things with it (oatmeal, steam vegetables, etc.) in addition to making rice that I don’t think of it as a unitasker. I give it two thumbs up! How about a toaster? In a kitchen where space is severely limited a toaster seems like a useless unitasker, especially since neither of us eat bread that often. However when I want toast (usually with eggs and bacon every once in a blue moon), toasting the bread over the flame on the stove or under the grill in the oven just doesn’t cut it. I’m really glad you mentioned the fire extinguisher. When I moved into my house in 1997, friends gave me one as a house warming gift. I shoved it under the sink. When I did have a fire in the bathroom on the second floor, I knew exactly where it was and put out the fire before it could destroy the whole house. After that I had two – one in the upstairs hall and one in the kitchen (on top of the fridge). If I was ever going to have a fire again, I wanted the fire extinguisher to be within fifteen feet of me (yes, my house was small – 450sq ft per floor). As an avowed fall-through-spring baker (summer’s too hot to do much of that in Texas), I have lots of unitaskers–in the form of decorative Bundt pans and cookie cutters. There’s just something about eating a yellow-lemon-rose-of-Texas pound cake in the spring, or a Christmas tree forest in December–along with appropriately shaped cookies along the way–that brings me (and lots of those around me!) great joy! I have both the egg timer that sits in the pot with the eggs and the cherry pitter. It takes up so little room in the drawer (it is the size of an egg, after all), so it does not make me feel more cluttered. My four year old will eat a small bowl of cherries for a snack when they are in season. It’s more of a mess for me to hand pit and cut them in half for him, so the pitter is perfect for us. My kiwi knife. It has a knife on one side and a spoon on the other. Perfect for lunchtime kiwis. My garlic press is high on my list. I would love one of those ice cream makers. I don’t know how often I would use it, but it’s one of those things that would be worth the cupboard space. My egg slicer. I know that theoretically you can use those to cut other things (like mushrooms), but I never do, so I have to count it as a unitasker – and I think it’s worth it. I love egg sandwiches and egg salad, and I don’t think I’d make them as much if I had to cut the eggs by hand. But the slicer doesn’t take up much space, either. I also have a tomato knife (it was sold officially as such), but for me it’s not a unitasker. It’s essentially a short serrated utility knife, convenient for cutting tomatoes and also for other small jobs that need a serrated knife (since our only other serrated knife is a long bread knife). My free Canadian Egg Marketing Agency microwave egg poacher. It’s a bit bigger than an egg, and gets used multiple times each week. I must say I love my little grill pan. It’s only large enough to cook a hamburger or chicken breast however I use it nearly every day. I freeze home made veggie burgers and use it to grill them. I’ll have to second you on the ice cream maker. While I don’t use it very often, we have an ice cream recipe that’s been handed down for generations that is a family tradition. Recently, I have been researching bread machines and have decided on the Zojrushi (Mini) bread maker. I know it’s a unitasker however it takes up the same amount of space as a toaster and I would like not having to buy bread. I plan on mixing pizza dough in there as well. And who can forget the watering can for my flowers, a paper shredder or hair dryer as unitaskers? Finally, I was organizing a client’s home office when I came across a warranty for a “Rotato”. Yes, it peels potatoes. I decided to ask my client about this item to get some perspective. It turns out she loves it. She hosts dinner parties several times a year (sometimes up to 70 people) and she cooks everything. She said she loves it because it saves her a lot of time. My favorite unitasker would be the orange peeler Tina posted. I used it all the time as I have several orange trees and it saves my fingernails from turning orange from peeling them. 1) At least 1 fire extinguishers should be in every kitchen, garage, and 1 for each level of your home. I’m a former vol. firefighter – had to comment on that. I also use my curling iron to iron out sashes for my shirt dresses and for curling ribbons on presents. I love my cherry pitter, as I love to make cherry pies and cherry infused vodka. All this being said, I have a fondue set that has never seen the light of day. I really need to get rid of that thing. @ Shaline – You can use you Brita water jug to filter cheap vodka into something much more palatable. Somewhere on Alton Brown’s cutting-room floor is the footage where he admits to keeping TWO unitaskers: a fire extinguisher and a corkscrew. If anyone uses a corkscrew (any kind, not just the fancy kind) for another kitchen task, I’d love to hear it. Also: a cherry pitter isn’t a unitasker! It works even better with olives. My husband prefers rice over potatoes. Our rice cooker is in use 5 days a week. I used to have a cherry tree in my yard. The cherry pitter was invaluable when 20 lbs of cherries needed to be processed (jam, dried – yummm). Breadmaker is getting lots of use. I was noticing some of my baking pans are used for only one recipe – maybe I need to expand my recipe collection? Third: @ M.R. Thanks for the curling iron idea!!! I have a few shirts that I never wear because they have sashes. that need to be ironed, and I never want to lug out my iron and board for just the sashes. What a fabulous idea!! Now for my unitasker: I have a fondue set. The fancy kind. with all the little dishes that rotate around the main unit. It’s huge and takes up a whole cabinet, but I love it when I throw parties several times a year! I love my fondue set even though it takes up lots of cupboard space. My family has fondue every Christmas Eve because it takes up lots of time when kids are antsy waiting for Santa. I also have the ice cream maker and it’s not a unitasker in my house. It makes ice cream, sorbet, and great frozen margaritas. I love my grapefruit spoons, but not for eating grapefruit. I make a lot of fresh salsa and discovered that the serrated tip of a grapefruit spoon is perfect for seeding jalapenos that are halved lengthwise. I used to use a small paring knife but this beats it hands down. And I found a pair of silver grapefruit spoons at an estate sale so I feel pretty lucky! 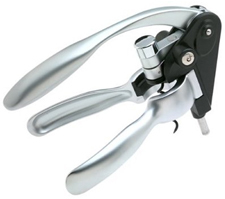 No doubt – 100% – my wine opener. Mine is a table top model so it takes up even MORE room but I can’t imagine not using it on a daily basis. Okay maybe every other day!!! My coffee grinder – nothing like fresh ground coffee. My newest toy – my wine refrigerator (are you sensing a theme). I splurged and bought one when I got my new house. My mom was cute when she first saw it – “can’t you put soda or other things in there?” – No strictly a unitasker Wine Fridge. But it has freed up space in my regular refrigerator. Just thinking – isn’t funny some of the things we use that are unitaskers. For example, a lint roller which is indispensable to me with a precious little kitty and chocolate brown furniture. But, isn’t that a unitasker? I do suppose I could get rid of the cat brush (another unitasker) and go straight at her with a lint roller but I think she might protest a bit! My phone. In lieu of telepathy it allows me to communicate with other people… whether I want to or not. I also have an electric griddle. Officially it’s not a unitasker, but it is to me: I use it only for making loads of pancakes, which I do about once a month. @ Shalin – a cheese grater can also be used to grate other things. I often use mine to grate carrots, zucchini, and apples. @ Janna – a rubber jar opener can also be used as a sink plug for, for example, doing laundry in the hotel sink. It’s easy to pack, doesn’t set off a metal detector, and fits any sink. The seal is surprisingly good. On fire extinguishers, I like to have them by the exits. That way once you can get to one, then you are between the fire and the exit and can escape if things don’t work out like you hope. Fortunately I have a door near the kitchen. Bedroom windows might be another good location (especially in first-story bedrooms). I’m with LolaG. I love my popcorn popper. But I hate air popped popcorn. My favorite is a big Stir Crazy popper. Hubby and I made a special trip to town when our last one broke. We’re on our third Stir Crazy. Someone asked if it were possible for a corkscrew to be a multitasker….if you have a waiter’s corkscrew, yes. They usually have a knife, foil cutter, and bottle opener in addition to the cork screw. Other than my cork screw, I’d say my coffee pot is a unitasker. But I wouldn’t part with it for any amount of money. In my home, coffee is always available. Once the pot is emptied, a new batch is being brewed. I stand by my egg timer… though ice cream maker and garlic press are good ones I hadn’t thought of. Also, a can opener. And a coffee pot. There are more of these than I realized…. We have a popcorn popper, but it’s not the electric kind. It’s a big pan with a lid that has a crank handle on it, that stirs the popcorn as you pop it on the stove. Let’s see, what else do we have that others have mentioned? Tomato knife (although it’s a lot less necessary since my daughter gave us the cool Henckels knife set). Pizza wheel and wedge-shaped pie-slice lifter. Coffee grinder (although I also use a small coffee grinder for grinding spices). Bread machine. Garlic press. We also have several small plastic doo-jiggies for getting the peel off citrus fruit (legacy of too many Tupperware parties in the past), a glass dish with a cone in the center for reaming out citrus fruit, and a zester for removing strips of citrus peel. I guess citrus is to us what wine is to others (we don’t drink). Let’s see, what else? Pastry cloth for rolling out biscuits and pie crusts (flour that sucker and NOTHING sticks to it). Pie weights. Letter openers. Seam ripper. Bead board. Oh, sorry to post twice, but something else just came to mind. I’ve never seen “pet bowls” featured as unitaskers. You know, the bowls you feed your pets out of exclusively? To me, those are quite the unitasker. However, my pets are fed from their own bowls. Anyone ever tried to remove the saliva residue that dogs leave behind on their feed/water bowls? What is that stuff, like some kind of super spit? Takes forever to get those things clean. I often wonder if they are actually clean when I’ve finished washing them. No way I’d eat a bowl of cereal from them! Mine is my motorized orange juicer. On weekends in the winter, I consider it a special treat to pull that out and be able to make fresh-squeezed juice without quite as much muscle strain as an old-fashioned manual juicer. The ironic thing is I absolutely *hated* orange juice as a kid. My parents made me drink it with dinner every night b/c they were concerned about me getting enough Vitamin C. At some point in college I decided I actually liked it. Now I feel deprived if I can’t have it with my breakfast for some reason! Nobody’s mentioned a coffee maker? My French coffee press is an essential unitasker around here. No, it can’t be used for tea once it’s been used for coffee. I use a tea pot or tea bags for tea. I’m the only one in the house who drinks coffee, so you could say it’s the ultimate unitasker in this house. Unless you count, as somebody else pointed out, my eyeglasses. i do own a cherry pitter and love it. my bf makes me delicious cherry hazelnut almond pancakes on the weekend and it helps tremendously! 🙂 i also couldn’t live without my grapefruit spoons, they make eating grapefruit soo much easier! My poaching boats! They’re these two little silicon “boats” that you put your eggs in and then float them in the pan of water. That’s all they’re good for, but they make PERFECT poached eggs, and they’re in the perfect shape for eggs benedict. I also really love my little sandwich maker even though I could make grilled cheese (or grilled ham and cheese, or any of the things I make in it) on a skillet. But they’re just so simple and easy and delicious, and so easy to clean up. I have to disagree about the inclusion of a fire extinguisher here. It is not a unitasker. I have not had the opportunity to test this strategy, but I was advised by a building inspector once that it is a highly effective self-defense weapon. If you are faced with an intruder in your home, you can deliver a very disabling but non-lethal blast to the face. I don’t keep a gun in my home so the fire extinguisher is next to my bed. I got a cake cutter with a Crate and Barrel gift card I got for Christmas thinking we have enough parties through the year to make use of it. I never once used it for a cake since buying it, but I went to the grocery store one day and saw a lettuce cutter. it was the SAME THING! I couldn’t believe it, so I went home with my head of lettuce and it cut it so beautifully, so now I’m actually putting my cake cutter to use, on lettuce. My once was uni-tasker is no more! As many of the comments here indicate, it’s not that a thing has only one use that makes it silly, it’s when that single-use is redundant (hot dog cooker) or impulse-buy-but-really-unnecessary (home cotton candy maker). I remember a few weeks ago, someone was making fun of waffle makers, which are unitaskers, but my kids love homemade waffles on the weekend, so we use it 5 or 6 times a month. That’s not clutter. And let me join the chorus of those coffee lovers who have noted both the coffee maker itself and the coffee grinder as non-silly unitaskers which don’t count as clutter. Seems to me that to count as clutter it has to be unneccesary. Something you use all the time isn’t clutter. I am going to add a vote to the cherry pitter since it is a messy and frustrating job withut this device. You can core onions with it as well. It is super cheap and very small. It could make tiny melon balls, if you decluttered the melon baller. Does anyone know about melon ballers anymore? Grapefruit Spoons. I don’t own any, but my mom had some when I was a kid. I haven’t been as successful at eating grapefruit since. I adore my popcorn maker! It gets pretty regular use. And even though we use the fondue pot once a year, it’s a Christmas tradition. Wok. Only used it once every couple of months for stir-frys, but now that I have a 6qt professional saute/braising pan, the wok performs best as a dust-gatherer. Garage sale, here I come. BTW, I highly recommend buying professional quality pots and pans from restaurant supply companies. They are much higher quality, and often cheaper, than the usual department store stuff, even the good stuff. Plus, they will last *forever*. I find they cook better, too. I picked up an 8″ fry pan a few years ago for $30 from a restaurant supply store after looking at retail cooking stores, where small fry pans were starting at $60. The only drawback is that pro cookware is very heavy. Also have a “Whirly Pop” popcorn maker (almost the size of a soup pot, and a non-foldable crank handle…!) that I will never give up, no matter the space it takes. I LOVE my electric griddle. I use it to make breakfast occasionally – usually pancakes. it works so very well. I guess it isn’t really a unitasker as I can cook pretty much anything on it, I just use it for pancakes the most. As another commenter mentioned… you can take away my life, but you can’t take away my waffle-maker. First of all, I agree with Aeon J. Skoble that a tool for a specialized task isn’t quite the same as a unitasker. But I understand how many people would think that rice cookers and bread makers are indeed unitaskers. Except that like others who’ve posted, my rice cooker is in use 3 times a week or more as we eat a lot of rice. But we also make some great (rice-based) casseroles in it as well. The bread maker gets used 5 – 6 times a week. Of course, I make bread in it, but I also make doughs for pizza, buns and rolls, and cookies; quick breads such as banana loaf; and desserts such as fruit cobblers. It’s a one pan clean-up. i heart my apple corer/slicer. 1. i can throw out the waste at the beginning of eating the apple. when i’m done, there’s no odd shaped core to dispose of (or balance on the coffee table until i feel like disposing of it)…. 2. i get to eat more of the delicious apple. and waste less. and apples are expensive, these days. 3. i can quickly make apple/peanutbutter snacks, for those occasions when just an apple won’t do. well, that’s mostly it. but, it’s definitely one of those tools that i thought was totally silly and frivolous until i had my very own. now i would never part with it. Reading all the posts makes me want to go purchase a lot of the things, and also makes me think of what I have that I rarely use. The first thing that popped in my mind that I don’t have but have always wanted to get it an orange peeler. My mom had one while I was growing up and it came in handy, but I have never found one in stores, so thanks Tina for posting a link where I can find one. Not that I haven’t eaten an orange in the last 10 years since I’ve been out of my parents house, but every time I peel an orange I think of my mom and her orange peeler and want one. I also have that exact wine opener, we keep it on the wine cabinet. I also have the ice cream maker, but haven’t used it in the last few years, time to go search for recipes and make some ice cream, especially since I crave ice cream just about every day. I also have an electric juicer that I use to make fresh lemonade, with lemons from our tree. But to top my list, I’d say my blow dryer I wouldn’t be able to live without it, or my remote control for the tv (that is considered a unitasker, right??). Oh I agree with the apple slicer!! I have one too and it makes cutting apples for kids so much easier. It is also great for making large fruit salads. I can cut up an entire bag of apples in no time. +1 on the rice cooker. I use it 6-7 days a week every morning for steel cut oats for breakfast, then 1-2 times a week for rice for dinner. Our cheese slicer, I know I could use a knife but it works great for nice thin slices of cheddar for sandwiches, grilled cheese etc. It takes up a bit of space, but no more than the veg. peeler, or the grater. Oh, and my new found love- my electric kettle. It beats stovetop hands down. It’s faster, and uses less electricity. I use it about three times a day! We got a Salad Spinner as a wedding present, and I returned it on the grounds that it’s a unitasker that takes up too much space. 4 years later, my husband was STILL bemoaning that choice and wishing aloud that we had one. I finally caved, and now we use it all the time- for fresh salads and for fresh chopped herbs. I guess some unitaskers are OK! I’ve never used my ricer for anything but mashed potatoes – but it makes awesome mashed potatoes. Actually I have a set of unitaskers that get pulled out at Thanksgiving: ricer, baster, and oil separator thingy for making gravy. my wife bought me a silicone egg ring for my birthday and i use it every morning. one egg, two pieces of toast with butter – and i’m out the door. I have this jar opener. I use it almost every day, and it is the most useful kitchen gadget I’ve ever acquired. Yes, I have working hands, but they are arthritic, and I can’t open jars or bottles, even ones that have been previously opened, without a lot of pain and frustration. This little thing makes all the difference in the world. I use my rice cooker to steam vegetables, make rice, fry onions, and cook curry stew. A unitasker it is not. I do however own a can opener (although I have a swiss army knife which does a perfectly adequate job), a jar opener, a knife sharpener, and a garlic press. I adore my tomato shark. I’ve decluttered big time but I had to keep my grapefruit knife. It’s the best for getting around the little grapefruit sections. If you eat grapefruit….you gotta have one! 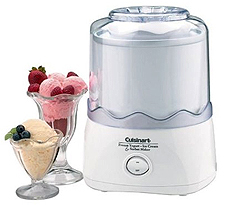 And I want a Cuisinart ice cream maker, badly. I never knew a rice cooker could be a multi-tasker…I have been set free and after I hit Submit Comment I am off to research recipes for my rice cooker (Which I love, because it can be done hours before dinner and waits for me). I have to admit to a Chai/Hot Chocolate Machine. It heats the milk and the mixture of Hot cocoa or Chai and has a frothing button, so the hot chai tea comes out just scrumtious…it comes out as soon as the heater goes on in the winter and stays til spring…. I also have a pastry cutter…but I cut my hard boiled eggs with it too! and mash my avacados with it…it is a royal pain to clean, but I like the nifty ergo dynamic handle…. I love my tea press for loose tea (can’t use it for coffee or the coffee smell/taste will ruin the tea) and also my garlic press. Coincidentally, I also have a blog post scheduled to release at the end of August that I wrote about a unitasker that makes sense to own. How weird. Great minds apparently DO think alike. So, I thought I’d share it here too. Melon baller. I know, I know. But it does one job well, dangit, and I like that job, so I own it. I will say though, that I prefer my old school waiter’s wine key to any of the big contraptions. But 20 years in the restaurant business will do that to ya! Rice cooker – I have one that fits in my steamer, but I’ve never learned how to use it because I make perfectly fine rice in a pot. I use the steamer all the time, though. As for unitaskers, I refuse to get rid of my coveted espresso machine and burr mill grinder. There is no way my coffee maker can be considered a unitasker! It makes coffee (a.k.a. the nectar of life) and keeps me from killing the people around me – especially the morning-inclined types. Also, my wine glasses don’t get used for anything other than wine, but I’m not getting rid of them anytime soon either. Definitely my microwave spatter cover (not exactly like this, but similar)- mine has a hole in it so it hangs on a hook right next to the microwave and it’s used all the time. And when my family visits, they drink a *lot* of hot tea and make heavy use of my tea bag squeezer. OMG, Beth, thank you for posting that peanut butter mixer! I definitely need that! I eat lots of peanut butter but I hate mixing it up because it makes a mess and is hard to do. This looks like the perfect solution. Another unitasker I have that hasn’t been mentioned is a bagel holder. It’s a piece of wood with sticks that hold your bagel in place so you can slice it in half easily. It’s great. Much easier than trying to hold the bagel up and slice it at the same time. My Sonicare electronic toothbrush. Nothing’s proved better against receding gums. My Yogourmet yogurt maker. I eat yogurt every day and love to cook with it as well. I can make two quarts at a time for a fraction of the cost of store bought. I recently lost my bread machine to a husband-with-good-intentions accident, so I have a Zojirushi on the way. BTW, I’ve got you all beat on the fire extinguishers- garage, kitchen, family room, and master bedroom. Our neighborhood was built in the early ’80s and we still don’t have fire hydrants. Our breadmaker. And with healthful bread currently over $4 a loaf at the supermarket, I contend that its one use is becoming EXTREMELY important. My favourite unitaskers: jar opener, apple corer, coffee maker (I’ve had to get a French press instead, after decimating two Bialettis by forgetting to put water in the base! ), cordless kettle, and the ice cream scoop. – Garlic press & tea ball/tea strainer. Daily use items in my kitchen. – Exercise ball. Don’t know if this counst as a unitasker because you can use it for a huge range of exercises, but all it’s used for is working out and it takes up a *lot* of space (and I have a crappy pump so I don’t deflate it after each use like some people do). – Toothbrush. Another one that doesn’t need justification! Medical devices (glasses) and safety equipment (fire extinguishers) should not count as unitaskers. Hey, that blowdryer is not a unitasker. You can put it on low heat and blow dust out of your keyboard. Old toothbrushes clean tiny nasty spots, new ones de-silk corn on the cob. I love the dishwasher, have a treadmill, and keep two coffee grinders. The electric is for convenience. The antique hand-crank model is the one I used post-foreclosure when I lived in a pickup truck and brewed coffee on a Coleman stove, and is kept for sentimental reasons. We’ll save that for another discussion on extreme minimalism. In the middle of moving and will now be getting rid of my quesadilla maker, waffle maker and brita water filter pitcher. Good riddance! Most may disagree, but we love our waffle maker. Of course, we make waffles from scratch at least once a week!